Accompanying the release of Windows 8.1 is Microsoft's official Remote Desktop app for iOS and Android, meaning you can access your PC while running around town with your iPhone or iPad or droid device. Compatible with iOS 6 and up and Android 2.2 and up, the Remote Desktop grants PC access using Microsoft's Remote Desktop Protocols (the name doesn't fall far from the tree, it seems). 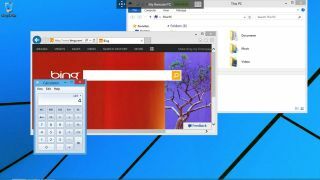 The app offers support for any Windows PC with Remote Desktop turned on - an option you can finagle in the Control Panel. From there, enjoy the somewhat surreal and miniaturized experience of maneuvering around your Windows PC on your iDevice. As noted by The Verge in its rundown, the app doesn't automatically pick out PCs on a network. In order to access one, you'll need to know the PC's IP. Whether at home or on the go, blips are good no matter where you're reading them.